I'd really like to add some text to it, but i'm not good in finding the right words for it. Should be something that expresses how disapointed the janus group is about your failture or how mi6 honors your suffering. Also i'd like to make them a little more differing e.g. make the Janus one old and withered with cracks and dirt on it while the mi6 one remains nice and polished. Maybe even with a different model shape that has some evil vibe. But than again this might be a little bit to much for the purpose of a gameplay object. BTW: Is there allready a possibility to see which player can be resurrected on that point, displaying the name of the player or something? Beta 1.02 may not be released until tomorrow because I've drastically altered its resurrection timer code and I want to make sure the changes haven't created new bugs. This mode's script now uses a ResurrectionTimer class to handle resurrection timers. BTW: Is there already a possibility to see which player can be resurrected on that point, displaying the name of the player or something? Unlike in MOHAA Freeze Tag, resurrection entities aren't associated with eliminated players. Instead each side has a resurrection queue and when a side's RE is used the player who has been in their queue for the longest time is resurrected. I chose to implement resurrections in this way because I think it's a better way of resurrecting players. With this way of doing it, players have a better idea of when they will be resurrected and no player will have a long wait to be resurrected because the RE associated with them isn't used. If anyone disagrees with me, then please post a message. Queued resurrections are the best way, for the reasons stated. Joe, I added in the ability to set an entities' position in Python (players and held weapons will ignore the command for obvious reasons). This will be in the next patch to GE:S.
I am also adding the ability to use the color codes in HUD Messages. So instead of 1 color for HUD messages, you can have many colors. Just slip the code into the mix just like in the localization files. 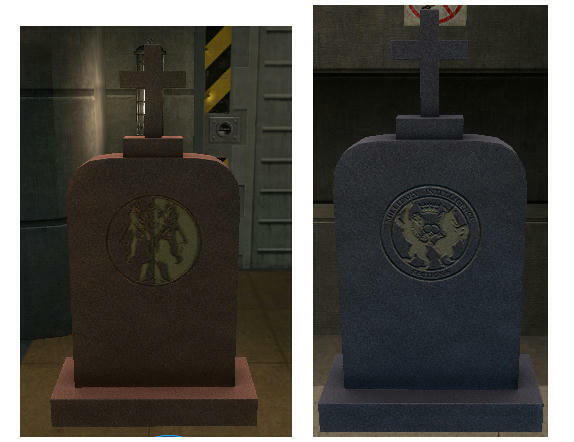 Thanks for making these great looking gravestones, I will include them in the beta 1.02 release. I will try to make a gravestone radar icon. There is now a screenshot from Beta 1.02 in this topic's first post. Thanks, when this patch is released I will use this new ability to make resurrection entities appear at player death locations instead of player spawn points. I've been thinking about this, and you should spawn them at player death points only when the player is killed by another player or themselves, not when it's an environmental death -- that way you prevent them spawning at the bottom of pits. You still will have the issue of players killed mid-air (like falling from Cradle and getting shot on the way down), but it's an improvement. Yea, imagine a floating tombstone lol. I'm sorry I still haven't released Beta 1.02, it still has bugs which need to be fixed. I've been thinking about this, and you should spawn them at player death points only when the player is killed by another player or themselves, not when it's an environmental death -- that way you prevent them spawning at the bottom of pits. Thanks for the help, I will do this. Does anyone know why telling the token manager to delete a capture area in the Beta 1.02 script's OnCaptureAreaSpawned() function is making GE:S regularly crash? This bug will crash GE:S every 4-10 minutes on the Silo map with 31 bots. #Don't allow a MI6 and Janus RE to be located at the same player spawn point. This mode is based on Mefy's MOHAA Freeze Tag Mode. this script uses lots of code that was created by the author(s) of the YOLT script. I've also reused code from the "Capture The Key" mode's script. The gravestones were created by Kraid. The up and down arrows in the crucifix RE icon were taken from the run icons. #Needed because deleting a RE in onCaptureAreaSpawned makes GE:S regularly crash. to one of your team's gravestones. Based on Mefy's MOHAA Freeze Tag Mode. self.eliminatePlayer(player) #Doesn't kill them but does set eliminated? attribute to true. if(teamNumber == GEGlobal.TEAM_MI6): return "MI6"
elif(teamNumber == GEGlobal.TEAM_JANUS): return "Janus"
#Get the survivor count for the victim's team. #the game will be ended by OnThink() when this function has finished. #Deleting the area in this callback function makes GE:S regularly crash, on Silo when it has 31 bots. if areasTeam == GEGlobal.TEAM_MI6: teamString = "MI6"
#Choose player to be resurrected. #If for some reason there is no player to resurrect, don't resurrect anyone. #If there are now no eliminated players, allow new players to join without needing to be spawned by their team mates. #Only called when a resurrection has taken place. I've now fixed all the Beta 1.02 bugs. I will do some more bug tests tomorrow and if I don't find any more problems, I will release it. Joe, I'm glad you're working on this promising gamemode, keep it up! I've now released beta 1.02, it can be downloaded from this topic's first post. 1. Bugs from the previously released versions have been fixed. 3. REs are now represented by a cross icon on the radar. 4. Players who kill themselves will now be eliminated. 5. Players are now shown a resurrection progress bar, instead of a remaining seconds count. 6. The count of survivors on each team will now be displayed from the start of a round, instead of becoming visible when the first elimination has taken place. 7. REs will now only been spawned when there is a free player spawn point. When a RE can't be spawned it will be added to a queue and spawned when a spawned RE is deleted. 8. The resurrection timer code is now simpler and better than it was in the previous versions. I was going to release Beta 1.03 yesterday but I didn't because I found out that this game doesn't have a kick voting system. This is a problem for Beta 1.03 because its purpose was going to be to fix two gameplay exploits by allowing players to eliminate their team mates when friendly fire is enabled. I was going to make this change because I think players would be much more likely to use the gameplay exploits than to eliminate their team mates intentionally or accidentally because by not using these gameplay exploits they would put themselves and their team at a competitive disadvantage. Players will be able to use this ability by aiming at one of their team's gravestones and holding down a key on their keyboard for 5 seconds. There won't be a resurrection ray like in MOHAA Freeze Tag because I don't think this can be implemented with the available scripting functions. I don't want to use the debug line drawing function because it's only meant to be used for debugging. The drawback of using a RE from long range will be that your enemies will be able to see that it is being used on their radar because its radar cross icon will become yellow. If this didn't happen, the players on a RE's opposing team would not be able to see that an enemy was using it. Do you have an estimated date of when this will be finished? I won't be able to finish this mode until the next GE:S patch is released because it will allow me to move REs to player death locations. I will try to have everything else implemented by the 1st of January. I will start implementing the long range resurrection ability tomorrow. I'm going to rent a GE:S server from a dedicated server provider. This dedicated server would be dedicated to running DAD mode and I will only rent it for a month. The purpose of this server will be to promote DAD mode and to provide a server where beta version test events can take place. Before I release version 2.00 with its addition of the long range resurrection ability, I would like to run a weekend beta test event on my DAD server for Beta 1.02. I'm hoping that some players will attend this event if I announce it in this forum topic. When I've finished working on this mode's script, I'm hoping that the GE:S developers will be willing to make this mode into an official game mode. If they will be willing to make it into an official mode, then I won't mind if they modify its script.